Our success results from our experience, the technological knowledge about plastic products and the reliability of our staff. You can expect from us a high standard of quality, as well as technically advanced products made of thermoplastics. New in the programm, we also process componants made of various fluoroplastics such as PTFE-M (weldable PTFE), and also ECTFE. If you do not find what you are looking for in our extensive standard delivery progam, we will gladly assist you with individual solutions according to your wishes. 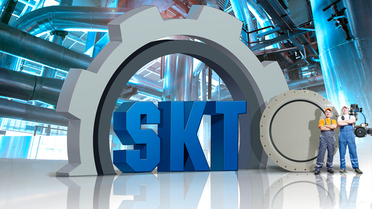 Whenever reliability and robustness are demand, SKT products are used. Whether in the chemical industry, in the production industry, metallurgy, the environment technology, in shipbuilding or many other industries.